Castleford Tigers half-back Tom Holmes will join Featherstone Rovers next season. Tigers have agreed to release the 21-year-old from the final season of his contract and he has signed a one-year at their Kingstone Press Championship neighbours. Holmes joined Tigers’ scholarship scheme as a 14-year old and went on to captain the academy team before stepping up to the first team squad. He made his first team debut for Tigers in 2015 and has made six senior appearances this year. He said: “I’ve loved my time here at Castleford. “Obviously it has been tough for me to get into the squad here this season with the two best half-backs in the league here in Luke Gale and Ben Roberts. “Getting game time now for me at this point in my career is crucial. He added: “Castleford Tigers has been home to me now for such a long time and I will be forever grateful to everyone at the club for helping me progress in my career. “I have had the opportunity to work with some amazing players and coaches during my time here and I have learnt so much but for my development and with me only being 21, getting week in week out game time is what I need. “I’ve still got a long career ahead of me and I would love to return to Castleford Tigers at some point in the future. Of his move to Rovers, Holmes said: “I am really happy to have the chance. “I think coming to a club like Featherstone will benefit me a great deal as a player and a person. 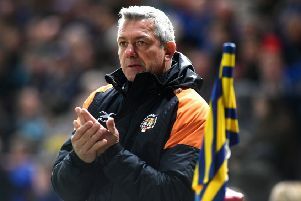 Tigers coach Daryl Powell said: “This is a great opportunity for Tom to play regular rugby league in the Championship. “Tom has been developing within our system for a few years now and has played a number of first-team games where he has acquitted himself really well. “However we feel now is the right time for him to focus on playing weekly in the Championship environment. Rovers coach John Duffy described Holmes as “undoubtedly one of the most exciting young talents in the game”.